Posted By Nathan On August 3rd 2017. Under Tips Tags: applicant tracking systems comparison, applicant tracking systems keywords, best applicant tracking systems, how do applicant tracking systems work, top applicant tracking systems . With ATS systems taking over the job application industry, it’s becoming increasingly important for companies to employ their services in finding the right employees under their wing. It is therefore essential for you as a job seeker to research and discover on ATS optimizers that will help make your application friendlier and more effective in the job market search! And we will do so by providing a list of the best applicant tracking systems tools available for you! Gives your resume a high ranking in the ATS: Meeting all the requirements of the ATS is important. And one way of doing this is by making sure that all the keywords the manager uses will appear on your ATS resume as well. That is why it is important to use a keyword generator tool to figure out the best keywords for a given job. Enrich your resume: Using relevant keywords will make your application stand out and be more professional than those of your competitors. This is especially helpful with both the ATS check, as well as when the hiring manager is reviewing your CV. Maintains key abbreviations of the job search: Key abbreviations of the field that you are applying to are important. They give your resume that attraction that you are well versed in that given field. And that is exactly what the employer likes to see! Here is an effective applicant tracking systems comparison of resume tools and online software out there to assist you in optimizing your cv the best way possible! Jobscan: One of the top applicant tracking systems optimizer, Jobscan will efficiently compare your resume against the given job posting and ensure that it has all the relevant and essential keywords available. It will also go the extra mile to give you concrete tips on how to improve your resume. There is a free trial to help you get starts, though afterwards you have to pay for the premium subscription. Resunate: A fierce competitor of Jobscan, Resunate is ultimately the second biggest resume optimization site out there! First of all, it allows you to copy and paste the given job description, and then you can compare it against your resume. It then proceeds to score the compatibility of your resume on a 10.0 scale. As with Jobscan, the initial trial is free, but a subscription fee is required to continue utilizing their services. stantly generate the keywords. And the best thing about CVLift is that it is absolutely free! iGrad: iGrad serves a dual purpose of being both a search engine and further a Job Genius Resume Analyzer that will scan your job description as well as identify the keywords necessary to improve your resume. iGrad is freeware as well! WriteWords: This software works uniquely in that instead of comparing and assessing your resume against a given job description, it identifies the most prominent keywords and makes them available to you. And guess what, it is free too! Wordle: Wordle is a cloud generator. All you need to do is paste the job description in the dialogue box, and it will generate a word cloud featuring the most prominent keywords. VocoGrabber: Just like Wordle, VocoGrabber is an effective cloud generating tool that ranks keywords based on their relevance. This cloud generator is free too, so you should take advantage of that! And with this list of applicant tracking systems optimizers, your resume will be improved and have a more professional outlook! Use standard resume headings: Be sure to stick to common resume headings that are used throughout the context of most resume applications. 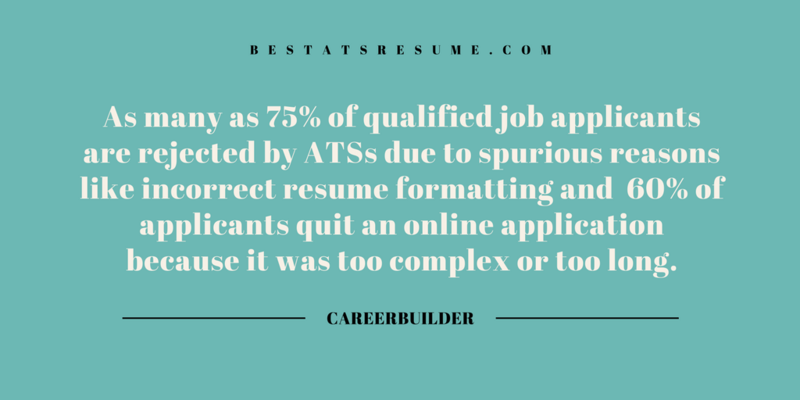 Choose the correct resume format: A majority of formats have at times been rejected because the applicant failed to use the correct format that is optimized for ATS. Normally, there are three main resume formats, that is: chronological, function, and hybrid. Ensure that your resume is formatted correctly to increase your chances of passing the applicant tracking systems process. Don’t touch headers and footers: As a strict outlook, headers and footers are a no-go zone. That means that you should avoid them at all costs and keep content as official as possible. In fact, we recommend that those who are applying for creative positions such web designing or architecture to apply such creativity ONLY during the in-person interview. Echo resume keywords exactly: If any feature can help you bypass the ATS check with ease, then it is using the resume keywords exactly. Always ensure to include them in a resume, no matter how short or straightforward your resume is. Write out all acronyms: Your resume is official right? So by all means, ensure you avoid the use of acronyms no matter how tempting it may be. We are talking of the LOL’s or OMG’s, or even the abbreviations of some company organizations. We encourage you to right them out in full because it assists the employer to comprehend exactly what you are talking about. You wouldn’t want to miss out on your next potential paycheck as a result of street jargon would you? So keep it official. And with that being said, these are most essential tips to helping you deliver a high quality resume that will definitely pass that ATS check! Do note that we also offer other essential resume application services such as writing, editing, proofreading, and effective confidence-building skills for in-person interviews! So get in touch with us today to essentially master applicant tracking system keywords optimization and overall application success!